It has been a slow crafting day. All I have been up to is overlocking fabric for pre-washing. It keeps the fabric from fraying and getting tangly. Joann’s had lots of cotton corduroy for $2.99 a yard so I bought two 4 yard pieces. Not sure what I am making yet, but at those prices I am sure it will come in handy for something. I also had to wash out the starch from the ticking and pre-wash the poplin and flannel for the sewing accessories. The washing machine has been going all day. 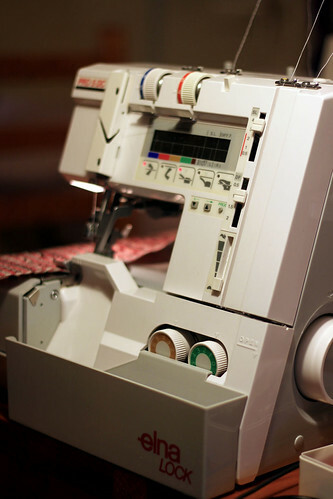 I have not photographed my Elna Lock Pro5DC serger for a blog post. Since I am trying to post everyday for at least a year I thought why not. This is day 285 in a row. This old machine has two things that are different from newer models. One is the bar that takes the wide toe away for a rolled hem. It just flips up, no need to change plates. 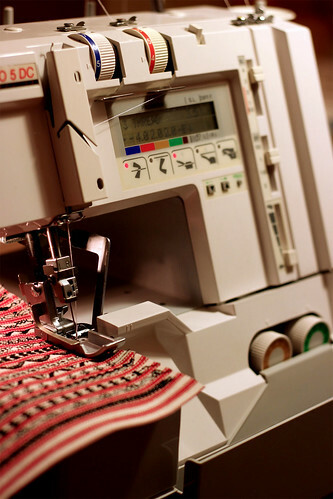 This machine was made before anyone thought to add a cover-stitch to a home machine. The bar would get in the way when doing a cover-stitch hem. If I get another serger I would want one with cover-stitch. The second thing is the plastic scrap catcher. It fills fast since it is rather small, but it is easy to dump and reattach. This entry was posted on Tuesday, August 4th, 2009 at 3:00 am and is filed under Sewing. Tagged: Sewing. You can feed this entry. You can leave a response, or trackback from your own site.